Mom of Many Words: You had me at "woof"
It has been a bit of a rough week, folks. Last weekend we had to say goodbye to Cubby, our Golden Retriever. His ailment, severe pancreatitis, came on quickly and swept through his body until there was no option other than to let him go. As pet owners and animal lovers, we know going in that a day like this is basically inevitable. It doesn’t stop us from making our pets a part of the family. We had waited two years before we even thought about another dog after losing our first Golden Retriever, Colby (yes, it is confusing), to cancer. While the Spouse and First Born, who was away at college, were more apt to welcome another cold nose, for Second Born and me it was a tougher transition. Colby was The Dog – our baby, our true puppy love - and his death was a long-burning wound that prevented us from wanting to risk the pain again. Then this one came along, this canine whose name was too close for comfort to Colby, this short-snouted 2-year-old Golden Retriever in the same shelter where his predecessor had claimed us. We weren’t even looking for a dog that September day. He was not supposed to change our minds. He most definitely was not going to change our hearts. Or so we thought. Oh, but he did. Cubby wrapped our hearts around his furry paw and suckered us in. He didn’t replace Colby, he simply brought to us his own sunny pooch personality, and he made us embrace him wholeheartedly. Today’s column is a tribute to the light Cubby brought into our lives, as I share with you – The Top Ten Things a Golden Retriever Would Never Say. 1. That platter of turkey is awfully close to the edge of the table. I’d better try and warn someone before it ends up on the floor. 2. Why would I want to climb on the sofa when I can be so close to the floor on this bed you got for me? 3. You want to go for a ride in the car again? But we just went yesterday! 4. I really don’t need any more toys, but if you are going to insist on bringing them home, would you please stop getting the ones that squeak? I find them very annoying. 5. Oops, the crate door isn’t latched. I’ll just stay right in here until someone gets home. 6. I really wish people would stop rubbing my belly. Personal space, seriously. 7. No, thanks, I don’t think I should have a treat right now. It might ruin my appetite just before dinner. 8. Shhh, quiet! A flock of birds just landed in the yard and I don’t want to disturb them. 9. Hey look, someone new just came in the house. I’ll just sit calmly off to the side and wait for them to come to me. 10. Can’t you just go for a walk by yourself? We all know the truth about dogs, especially breeds with the personality of a Golden Retriever. Everything they do is their favorite thing. Cubby was a redheaded charmer, trash sniffer, flirt and clown. Our handsome, crotch-sniffing, curly-haired boy gave his all to his family. We will miss that spark for quite a while. I am just getting around to removing the strongest reminders of his presence. Today we are taking food and other items to the animal shelter... but we won't be walking through the kennel area. If he could be here right now, surrounded by his many mangled squeaky toys, I would tell him that I wish I had walked him more often, given him more treats and even let him up on the sofa, at least a few times. 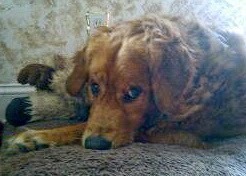 But in his adorable, slobbery way, Cubby’s sweet nature let us know every day not to put emphasis on what we didn’t do. His response to any regrets would have been simply this. You gave me my forever home. And that was my favorite thing.